(1-30-18) North America will be treated to a blue moon, super moon and a lunar eclipse all at once during the early morning hours of Wednesday, an event that hasn’t happened in over 150 years (March 31, 1866). The full moon will rise on the evening of Tuesday, Jan. 30, and set around daybreak on Wednesday, Jan. 31, local time. 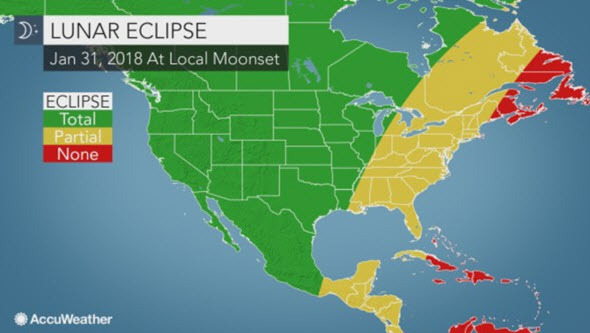 People all across North America will be able to see the moon light up the night sky, and those in the central and western parts of the continent will be able to see a total lunar eclipse.